Filled with extraterrestrial sea monsters? In the distant darkness of the solar system, below the cracked surface of the dwarf planet of Pluto, lies an ocean, slowly freezing into an exotic form of ice as its heat ebbs away into space. That's the conclusion of the latest analysis of the data sent back by Nasa's New Horizons probe, which whizzed briefly past Pluto in July 2015 - our first ever visit to one of the solar system's most distant objects. The probe collected a wealth of information about the icy planetoid, much of which is still being analysed a year later. The pictures that the spacecraft sent back showed that Pluto is more complex an object than we thought. It's surface is made up of different kinds of ice - water ice, as well as frozen nitrogen and methane. During its flyby, New Horizons spotted giant crevasses in that ice - fault lines running hundreds of kilometres long and four kilometres deep. "What New Horizons showed was that there are extensional tectonic features, which indicate that Pluto underwent a period of global expansion," says Noah Hammond, author of a new study into the planet. "A subsurface ocean that was slowly freezing over would cause this kind of expansion." The question of how that ocean would remain liquid so far from the heat of the Sun is easy to answer. Researchers believe that there are enough heat-producing radioactive elements within the rocky core of the planet to melt part of its icy shell. 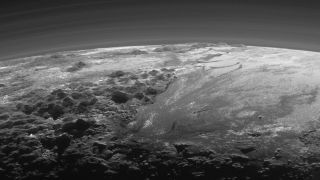 Over time, the outer parts of the melted portion would start to refreeze, expanding in the process, and causing the features that New Horizons photographed. But how do we know it's still liquid today? That's actually quite an interesting question. The low temperatures and high pressure within Pluto's body means that any ice present would quickly be converted into a new form called, wonderfully, "ice II" (there are actually almost twenty different kinds of ice). Ice II has a more compact structure than regular ice, so if that had happened then we'd see evidence of global contraction on the surface of the dwarf planet. "We don't see the things on the surface we'd expect if there had been a global contraction," Hammond says. "So we conclude that ice II has not formed, and therefore that the ocean hasn't completely frozen. Those exotic ices are actually good insulators - they may be helping Pluto from losing more of its heat to space." So, if the researchers are right, then Pluto has an icy shell about 300 kilometres thick on the surface of the planet, hiding a deep, dark ocean of liquid water below. It's far too early to tell if anything could be living in that ocean, but it's believed that life could exist in other subsurface seas in the solar system, like those on Saturn's moon Enceladus and Jupiter's moon Europa. "That's amazing to me," says Hammond. "The possibility that you could have vast liquid water ocean habitats so far from the Sun on Pluto — and that the same could also be possible on other Kuiper belt objects as well — is absolutely incredible."